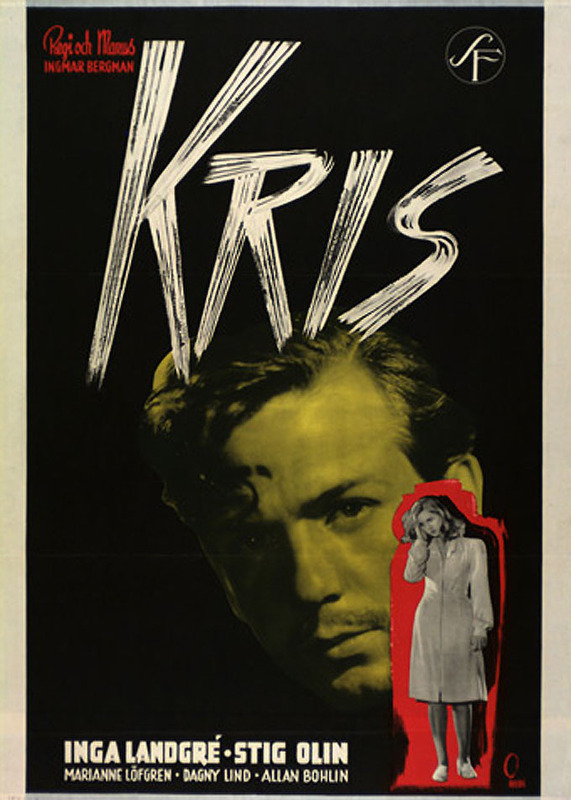 Fabulous early Bergman melodrama with many pointers to later masterpieces. (possible spoilers) Like much of his pre-'Seventh Seal' early work, Bergman's 'Crisis' has been called a melodrama.One can see the attraction of the label - the largely cramped theatrical settings, the plot, with a prostitute coming to a sleepy provincial town for the daughter she abandoned 18 years earlier, taking her back to the big city and a young lover-coded-pimp, the squalls of over-emphatic music at key moments, the accumulation of narrative tension finding release in sexual violence and death, the contrast between the sophisticated, but corrupt ethics of the city, and the decent, but dull values of the country, coded in costumes and architectural space, the 'doomed', morally impotent young anti-hero. But if 'Crisis' is a melodrama, it belongs to the work in that genre by those great directors who, like Bergman, began their careers in the theatre, Max Ophuls and Douglas Sirk.Like them, Bergman takes a form dependent on moral certainties to create a world where such certainties have cased to exist.This is not to say Bergman has contempt for the genre he works in - like all great melodramatists, he gives vivid dramatic form to oppositions, for instance, the cramped, interior world of Ingeborg, and the fresh, location shooting in which we first find Nelly, or the young people's jazz intrusion of a fusty mayor's ball.He respects the melodrama's focus on women, their stifling in set social roles - prostitute, mother, spinster, lover, daughter, illegitimate child, ideal, whatever. But what Bergman cleverly does is milk the expectations of genre, only to totally confound them.When Jenny comes to abruptly collect a daughter she simply dumped on Ingeborg, followed by a young man clearly coded as a pimp, we imagine the sordid horrors into which Nelly will be flung, especially as she's seduced by Jack with drink, fine words and jazz.Her mother, dressed in black, and shamelessly free with her body as she takes a foot bath, all suggest a licentiousness into which the 'innocent' will be trapped.The huge elision between her leaving Ingeborg, and the latter's visit to the city, marked only by a letter of dubious provenance, contribute to the bad omens.And yet, as Ingeborg discovers, Nelly is quite respectably working in the beauty salon as her mother had promised, she has new clothes and friends.The young man is no pimp, but an aimless sponging egoist. This isn't mere leg-pulling on Bergman's part - it's a way of forcibly shaking us out of lazy assumptions.The supposed haven of the village is shown to be repressively conformist and culturally dead, while Nelly's aunt's house combines lassitude with penury.The location shooting that seems to express Nelly's authenticity become a Skakespearean stage, where Jack seduces here, and the prosaic Ulf beats him up, in a heavily stylised and brilliantly artificial masque. Bergman from the opening narration emphasises the fictiveness and theatricality of his story, where his marionettes are continually placed in transposed theatres: his framing, as with Ophuls and Sirk, is elaborately intrusive, capturing characters in boxes or behind bars, the sequence shot at the ball, the camera moving from the kids jiving to the old folks' pretentious horror is a masterpiece of concise visualising of themes, catching these two seemingly disparate groups in the one trap. The heavily contrived finale is not only introduced by a glaring narrative elision, but is soundtracked to the noise from an adjacent theatre.Add to this the dreams and anxious visions of Ingeborg, which, like the young hero's in 'Fanny and Alexander', seem to seep into the narrative itself, so that it is difficult to tell whether what we are watching is objectively happening within the narrative, or thesubjective projection of a lonely woman's nightmares, and you have a structural ambiguity, with which Bergman not only transcends the limitations of traditional melodrama, but points forward to the impulses of his finer later work.